Time is running so fast. A few months ago the fellow UL backpackers over on ther German trekking-ultraleicht.de forum where wondering where to go for their inaugural winter tour. I threw Finland into the round, the people rejoiced and so I was busy over the last months arranging for the six Germans and one Austrian to come here, and spend a week of backpacking & sauna in Finland. Along with the people will be a wide variety of different gear. LAUFBURSCHE, the upcoming SUL cottage from Germany is coming to showcase the latest developments in the shelter, bivy and backpack field, and test it in the cold weather of the Finnish winter. Along he will bring me a wonderful, black SUL backpack. A few fellow outdoor bloggers, Q, RioLeichtsinn and Sabine will also come along, as well as Knilch and nature-base. Its going to be a wonderful experience, I am very sure. Our plan is to spend four days, three night snowshoeing around 60 km to the Teerilampi cottage, which we rented for three nights. From there we will make day trips to the nearby Seitseminen National Park and enjoy a hot sauna and a dip in the ice hole, before we head back to Tampere next week Friday. 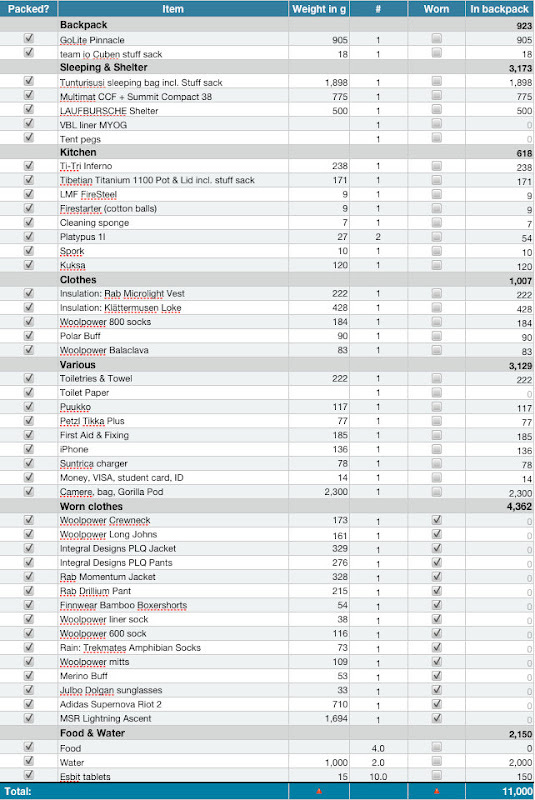 My packing list. Its work in progress, as I haven't yet settled on a shelter. I also haven't yet sewn my VBL. And I am not sure if I will take my new bivy which I get from Q. I haven't yet purchased all the food and drink. Haven't yet copied the part of the map I need. No second battery for the heavy camera. So come Friday, I hope that I can post the final packing list before I disappear for a week. But do not despair, updates will come along, as with the power of the iPhone mobile blogging shenanigans could occur, making you smile with photos and the latest information on our adventure! Also normal posts will go up, so if you aren't yet subscribing to the RSS feed or are a Follower, its time you click on the button to the right!